Sangamithra is an upcoming Tamil movie which is writted and directed By Sundar C. The cast of movie includes Jayam Ravi, Shruti Haasan and Arya in the lead roles. 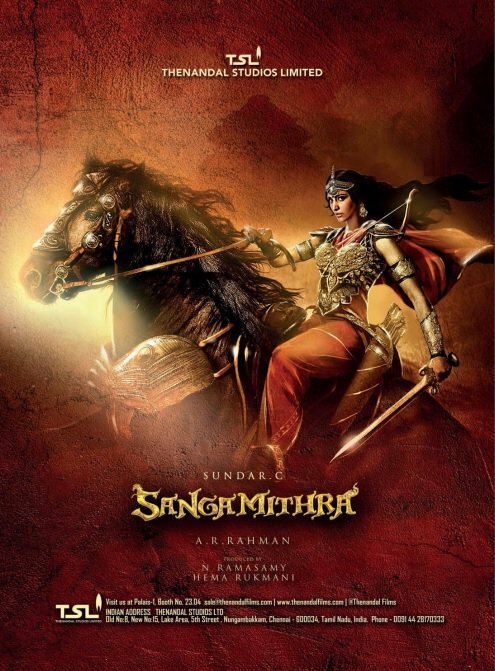 The story of Sangamithra set in the8th Century AD. Movie is produced by Sri Thenandal Films. Oscar winner AR Rahman is composing music for this movie, art direction by Sabu Siril. Sundar C. is an Indian film director, producer and actor. He has directed over 25 films in Tamil and Telugu languages. Initially, he worked as an assistant director to Manivannan and became a director with the family drama Murai Maman. His notable films include Ullathai Allitha, Arunachalam and Anbe Sivam. He made his acting debut in 2006 with the film Thalai Nagaram. He made his directorial debut in Telugu with the film Something Something.